Logan, county seat of Hocking County, the rural wonderland that sets about fifty-minutes southeast of Columbus, wasn't as hard-hit as the capital city has been by the snow storm of the past twenty-four hours. But we've been under a Level 3 alert, meaning that only emergency vehicles could be on the roads. In Columbus, over 20-inches of snow fell. Here, we got about half that. I spoke with my dad, who lives in Columbus, little more than an hour ago, and he says that, at this point, he can't even really open the door of his house. Fortunately, he and mom are stocked up. Getting snowed in can occasionally be fun. But I am definitely ready for this winter to move on. By the way, the Columbus Dispatch weather blog is great. Its coverage of the storm has, I think, been better than that appearing in either The Cincinnati Enquirer or The Cleveland Plain Dealer. Q-and-A: Is It Wrong for Christians to Become Angry? Q: Is it wrong for Christians to become angry? A: For some people, anger is a way of life. Filled with a sense of personal inadequacy, unable to cope with life, they lash out at others, usually spouses or children. Through outbursts of anger, they think that they can control their lives. But anger isn't always bad. This may come as a surprise to some people, Christian as well as non-Christian. If you are a Christian, you may have had the experience of becoming angry with a family member or co-worker and then hearing them indignantly say, "And you call yourself a Christian?" The Christian may feel ashamed, thinking that they've given a bad witness of their faith because they lost their cool. But they may have no reason for shame. An interesting passage in the New Testament tells us, "Be angry but do not sin." The very phrasing of that admonition should tell us that there's nothing inherently wrong or sinful about getting angry. It's possible to be angry without engaging in sin. One clearly legitimate reason for being angry is when we see an injustice. Once, Jesus entered the temple in Jerusalem. It was the center of Judah's worship life, the place where Jesus and His fellow Jews said that the presence of God lived in a place called "the holy of holies." One of the ongoing activities of the place was the sacrificing of animals or, in the case of extremely poor believers, cereals, on the altar. Most people came to the temple without sheep, doves, or cereals to be used as sacrifices. Those would have been purchased at the temple. But those purchases could only have been made with special temple currency. Set up in the temple then, were various "money changers," who would exchange whatever currency worshipers might have for the temple money, apparently at exorbitant rates. After securing the temple money, the faithful would then have to purchase the objects of sacrifice, again for exorbitant sums of money. The entire business was unjust. Playing on the piety of sincere worshipers of God, the temple merchants made a killing. This enraged Jesus! No wonder He upset the tables where the business was done and set the animals there to be sacrificed loose. As Christians, we believe that Jesus was both God and human and that our salvation depends on Him having led sinless life above reproach. Only a sinless Savior could be the perfect sacrifice for our sins. If anger were always a sin, Jesus' ability to work forgiveness of sin in our lives would be forever negated. But anger can lead us to sin. We can also be angered when a person treats us inconsiderately. Is that wrong? Not, apparently, if we use our anger as an occasion to work things out with the other person. "Be angry, but do not sin." Anger can lead to sin when we nurse it, feed it, and allow it to cause us to be sanctimonious or to be disrespectful of the person with whom we're angry. It's a sin to be self-righteous or hateful. The same New Testament verse that advises, "Be angry but do not sin," says that when we do get angry we shouldn't let "the sun set on [our] anger." In other words, resolve your differences. Jesus, in fact, gives a process by which conflicts can be resolved among believing people, one which I think contains principles for resolving differences among all people. In Matthew 18:15-20, Jesus says that we should first go to the person we feel has treated us unjustly, confronting them directly rather than gossiping about them. If no satisfactory resolution results from that confrontation, a disinterested third party, another believer, should be asked to, in effect, mediate, offering a solution. If the confronted party still refuses to deal with matters, an authoritative group within the Church should be brought in to mediate. If this process looks cumbersome and not worth the trouble, that may mean that the situation that has made you so angry may not be a big enough deal to warrant such treatment. If that's the case, then you should simply ask God to help you forgive and then go on. The last thing you want to do is to continue harboring anger. It's this harbored anger, I believe, that Jesus has in mind when He says, "“You have heard that it was said to those of ancient times, ‘You shall not murder’; and ‘whoever murders shall be liable to judgment.’ But I say to you that if you are angry [some of the ancient manuscripts insist that Jesus adds here, "without just cause"] with a brother or sister, you will be liable to judgment; and if you insult a brother or sister, you will be liable to the council; and if you say, ‘You fool,’ you will be liable to the hell of fire" (Matthew 5:20-22). Much of our anger is unjustified. And it could be avoided if we would remember Paul's admonition in the New Testament book of Philippians: "Do nothing from selfish ambition or conceit, but in humility regard others as better than yourselves. Let each of you look not to your own interests, but to the interests of others" (Philippians 2:4). Chances are, 95% of our anger would go away if we followed this advice. Anger isn't always wrong. Some people say that we should count to ten before expressing anger. That's not bad advice, especially if during that ten-second interval we ask, "Lord, am I justified in feeling anger? Let me know one way or another and then, whatever may be true, tell me how to deal with it." Martin Luther once considered David's great prayer of confession, Psalm 51, composed after he had committed adultery and murder. David, Luther noted, prayed as soon as the prophet Nathan had confronted him with sin. This contrasts with those who fail to approach God because they feel that their sins--even their temptations--make them too objectionable to come into the presence of God. "At precisely the moment when you feel the strongest temptation and are least prepared to pray," Luther says, "go to a place where you can be alone. Pray the Lord's Prayer or any other prayer you can think of to defend against the devil and his temptations. Then you will feel the temptation decrease and Satan will run away...Waiting [because you think you're too impure to approach God] is an unchristian approach to prayer. It's a teaching that comes from the devil..."
As David's confessional psalm shows us, we need to approach God as soon as we're aware that we have sinned as well. Luther writes, "The time when you feel your sins the most is exactly the time when you most need to pray to God." Jesus, when asked why He spent so much time with notorious sinners, explained that it wasn't those who were well who needed Him as their physician, but those who were sick with sin. Similarly, if you and I wait to be "clean" of sin or its allurements to approach God, we never will come to God and only grow sicker. The time to go to God for protection from temptation is when it's hitting you hardest. The time to approach God for forgiveness is the very moment you've come to your senses with the realization that you've sinned. 1. There is an overarching theme that connects this week's lessons. Each make the common affirmation that God's Word, whether spoken by God Himself or through others, has the power to give hope in hopeless situations. When the promising young Hebrews were dragged into exile in Babylon, they were not kept in prisons or even camps. They were free to marry, build homes, plant crops and exchange goods. Some became quite wealthy. They were also free to assemble, elect leaders and worship. But the Hebrews had a hard time worshiping in exile because they never got over the destruction of their holy city and temple in Zion. They were not where they wanted to be, or where they were supposed to be. So they lived with a sadness that ran down to their bones. And they refused to "sing the Lord’s song in a foreign land." (1) Because they had always associated God with the promised land, they didn't know if God was still God in a foreign land. Had God abandoned them? Was God powerless? (2) Did they really need God when, in modern terms, they had all the steaks and flat screen TVs they could want? It isn't the hard times that keep people from believing in God or from hoping. It's having all that you think you need. Ezekiel addressed people whose affliction wasn't deprivation, but a lack of hope. The Babylonian conquerors of God's people made the same bet that such modern-day tyrants as Vladimir Putin in Russia and the ruling elite in China are making. Give people the stuff they crave, such rulers reason, and people will gladly submit to imprisonment. But imprisonment to material wealth and "freedom on the edges" kills the human spirit. It leads to the death of hope. As Philip Yancey points out in his discussion of the Old Testament book of Ecclesiastes, the cynicism and hopelessness of that book, not to mention the works of existentialist writers, was born not of impoverished people, struggling to live, but took hold among people who had plenty to eat and much to keep them entertained. It's only people who have all that the world has to offer who doubt God. When you have nothing but God, you have nothing to fear. When you have everything but God, you fear everything. Most of all, you fear that the stuff that has become your god, the means by which you measure your value and the things on which you rely for life, will be taken away from you. The dry bones in Ezekiel's vision are the people of Judah whose hope had died because they no longer wanted to return to Jerusalem and no longer believed that God could offer them anymore than the "bread and circuses" that their Babylonian captors gave them. 4. Psalm 130 is one of the "song of ascents," sung by religious pilgrims as they climbed Mount Zion in Jerusalem, home of the temple. It's an expression of hope in the midst of despair. Though I am in a dry bone in a valley, the psalmist effectively says, I will wait for you to come and speak Your Word, O God, and I will live. The psalm ends with a call to Israel to "hope in the Lord" Who even forgives the sins of His people. 5. In Romans 8:6-11, part of just what may be the greatest chapter of the Bible, the apostle Paul sets flesh off against spirit. Here, flesh is the world system, the world's way of thinking. The flesh represents this dying world. He says that it's futile and a bad bet to place the weight of our hope and trust on flesh. Rather, we need to bet on spirit, the things of God. Life in the spirit, which is the life we lead when we let Christ in as the authority, Lord, and Savior of our lives, animates us with the life of God, like the dry bones of Ezekiel's vision, like the once stinking corpse of Jesus' friend Lazraus from our Gospel lesson. The believer in Jesus lives beyond death because of Christ. The same Spirit Who raised Christ will raise those in whom Christ lives. 6. The Gospel lesson, John 11:1-45, presents yet another lengthy lesson from the fourth Gospel, like those we've had over the past several weeks. It's understandable that the lessons from John over the past several weeks have been so lengthy. Each present long narratives of individual events, not easily broken down. Yet, it's also a shame in way. John is the most accomplished artist of the Gospel writers. Each incident he recounts is filled with multiple layers of significance. It makes preaching on the text extremely difficult. What does a preacher (or a teacher) leave out this time? 7. John 11 tells what happened when Jesus' friend Lazarus died. Jesus called from outside of Lazarus' tomb and brought His friend back to life. 8. This is not a tale of resurrection. The resurrected Jesus, after all, still lives and will return to the earth in bodily form. Lazarus though, presumably died again. I'm taking a day off. Earlier today, taking advantage of the temporary respite from winter weather, I went for a walk. I just got done working out on my aerobic stepper. Earlier, I was able to spend some time with my wife before she headed for work and do my daily devotions at a leisurely pace, then read more from Philip Yancey's great book, The Bible Jesus Read, which I highly recommend. I don't remember a World Series team in the free agent era to return the following spring with so much of their roster intact. Sean McDonough reported just prior to the first pitch that the Sox are returning 23 of last year's 25-man roster. Stability can be a real advantage, especially when rosters shift so much. But it's an "advantage" than may be of limited value. That raises a question: Can the Red Sox fight the advancing years of their aging team to make another run for an AL pennant? I'm happy to see former Reds "mayor" Sean Casey playing first base for the Red Sox. Casey is a classy guy and one of the hardest-working pro athletes in the country. He'll be a good fit in Boston, which along with Saint Louis, can credibly claim to have the most passionately knowledgeable baseball fans around. Joe Torre will seek to work his calm magic on the Dodgers. I've not liked the Yankees since the Maris-Mantle days. But I have always liked Torre. It's true that his prospects for managerial success have been bolstered by the mega-revenue and mega-spending of the New York club--don't get me started on the need for more revenue-sharing in Major League Baseball, Torre is nonetheless a great manager. He not only knows how to use his personnel, he knows how to relate to them as human beings, no small skill in such big-market, big-ego franchises like the Yankees and Dodgers. So, if you're at home right now, snap the TV on, then sit back and relish the fact that spring is almost here. It's March! By the way, my second-favorite sports month? November. College basketball gets its start and Ohio State plays Michigan in football. That phrase, coined by Fyodor Dostoevsky, used in The Brothers Karamazov, is the title of this excellent reflection by journalist Philip Yancey at today's Our Daily Bread. It's definitely worth the few minutes it will take for you to read it. You'll find it here. Rick interviewed me on his Internet radio show. We talked about the Ohio primary and how Christians might think about this year's presidential race. Thanks, Rick, for inviting me to be with you. It was fun! Here in Logan, Ohio, where I've served as pastor of Saint Matthew Lutheran Church for four months, concerns about the economy run high. That's because this town of 6000, nestled in the beautiful Hocking Hills, county seat of Hocking County, has been hard hit by a number of plant closings over the past decade. People who once worked decent-paying factory jobs are, in many cases, unemployed or underemployed. A small contingent of the county's population are transplants or college-educated Hocking County-natives who commute to Columbus, with work locations between forty and sixty minutes away. But others don't have such options in this area highly dependent on summer and fall tourism and farming. The consequence: Enormously long lines at local food banks and pantries. Our congregation has become so concerned about the situation, that our members are responding compassionately with increased donations of food and funding for an organization sponsored by the county ministerial association, CHAP (Clearing House Assistance Program). CHAP runs an emergency food assistance program and has recently announced its desire to buttress its rent- and utility-assistance programs. But the sea of people who arrive for monthly food provided by Second Harvest through the ministry of Smith Chapel, a congregation of the United Methodist Church, provides vivid testimony of the depths of the unemployment and hunger crisis now facing many in our area and in other so-called Rust Belt states like Ohio. Logan and Hocking County were profiled in this piece in The Chicago Tribune and I can vouch for the article's accuracy. Politically, the article points out, this crisis is increasing interest in the presidential race, in the Democrats in general, and in Barack Obama in particular. That's true even here in overwhelmingly white southeastern Ohio, a place where many pundits have speculated that African-American Obama may have a tougher time getting votes. Anecdotally, I pick up on almost zero concern about or references to Obama's race among the folks with whom I routinely interact here in Logan and in Columbus, my hometown, a place I visit often these days for hospital visits. And, it should be pointed out that Obama's home state of Illinois, directly west of Ohio, separated only by Indiana, has people in southern Illinois who share many of the same demographic characteristics of southern Ohioans--white, rural, small town folks, who live in traditional manufacturing communities that have lost industry--and that state has helped vote for Obama in a senatorial primary and election in 2000 and in this year's presidential primary. Concerns about the economy will almost always trump all other concerns in any given year and in Ohio, that increasingly means that people are taking a look at Obama, even, my conversations show, those folks who have usually voted in the Republican primary. Why Obama is more the beneficiary of these economic concerns than is his rival, Senator Hillary Clinton, I can only theorize. But it seems to me that throughout this nominating process, we've seen that Clinton has a large, loyal base of support within the Democratic Party. It's composed in part of people who loved her husband, of older women who see a vote for the New York senator as an opportunity to do something historic, and of some of the other older, traditional Democratic loyalists. But in most of the contested primaries this year, Clinton hasn't seemed able to nudge that base of support up. The frustrating thing for Clinton has been that the more she campaigns in contested states, the more she falls behind. Her level of support, impressive as it is, seems to remain fairly flat. That's because Obama has been able not only to excite young people, but also folks within the Democratic Party who are either part of the 48% of the country who themselves say they will never vote for Clinton or who look at Clinton's high disapproval ratings and, because they want a Democratic victory in the fall, decide to go for the senator from Illinois. Ohio, with its large union vote, may still give a win to Clinton, who in many ways, is seen as the more traditional candidate of the two remaining Democratic contenders. But if that happens, it won't be a comforting vote for her. Most polls in Ohio show her margin of victory being within the usual 2-to-4% margin of error. Like Bill Clinton in 1992, I believe that Hillary Clinton this year must win in both Ohio and Texas in order to remain credibility in the nomination race. The impact of eleven consecutive Obama wins cannot be blunted by anything less than convincing Clinton victories in these two states. With an almost certain loss in the Lone Star state and a probable win or loss by a small margin of victory here, I expect Hillary Clinton to withdraw within days. For several years now, I've been saying that 2008 was the Democrats to lose. But when I first said that, I thought that the central issue of the campaign would be the war in Iraq. With Iraq at least temporarily mollified by the surge and the ten-dollar-a-week payoffs to that country's once-pervasively violent Sunni population, the war has been taken off the front pages of our collective consciousness. The economy, at present, is the biggest issue of 2008. 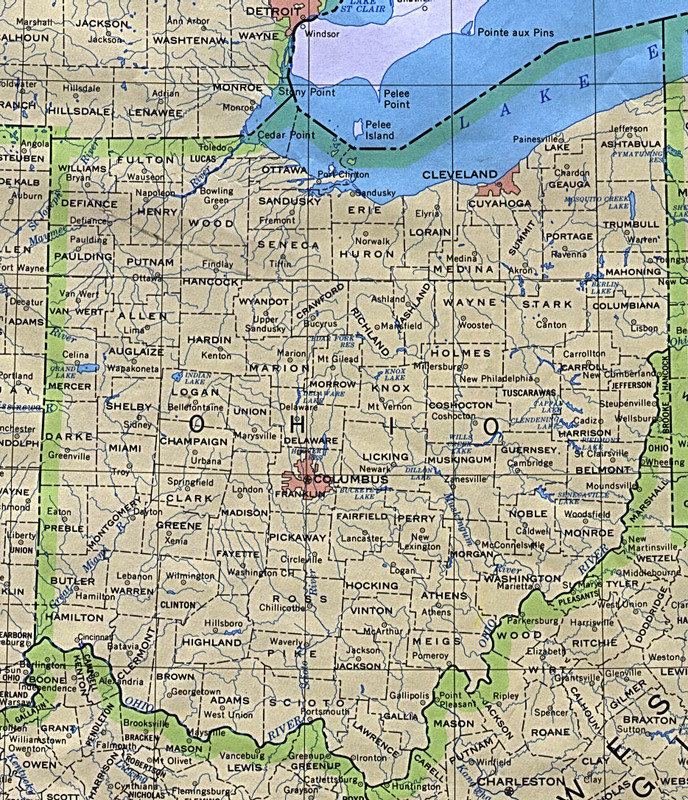 That issue favors the Democrats in places like Hocking County, as well as in the heavily industrialized northern Ohio cities of Cleveland, Akron, Youngstown, Canton, and Toledo. And it favors them even more pervasively than the war, an issue with many attendant ambiguities for the Dems. That's because even Democrats and Republicans opposed to the war question leaving Iraq precipitately and stew over the ability of either Clinton or Obama to deal with national security issues. Obama seems better able to communicate empathy and hope to people concerned about the economy here in Ohio, where our unemployment rate is one point higher than that of the country as a whole. That may be enough to give him an Ohio victory and, therefore, the Democratic nomination. But however things go politically this year, while governments wrestle with the demands of shifting world economies and how to deal with those realities in a long-term way, churches and other concerned groups of people will need to find more ways to deal compassionately and creatively with the plight of hungry, unemployed, and underemployed people. It's one of our biggest challenges these days. When I was growing up, we neighborhood kids played a game in the later hours of the night right before our parents called us in to take our baths and go to sleep. It was ‘Flashlight Tag.’ In Flashlight Tag, one person was “it” and tried to expose those who hid in the darkness. I remember that it always brought a sinking feeling when the person with the flashlight found me. I didn’t like it at all! The Bible, you know, describes Jesus as “the Light of the world.” We like that when it means that Jesus lights our ways through life and shows us that He is the way to heaven. But sometimes, when His light is cast on us, we see the darkness that resides within our souls--the sin, the selfishness. Truth is, we don’t like that any more than I liked being found in a game of Flashlight Tag. The book of Ephesians, from which today's second lesson comes, is divided by scholars into two main sections. The first three chapters deal with the issue of exactly what Jesus Christ’s death and resurrection mean for the relationship of Jewish believers in Jesus and non-Jewish (what the Bible calls Gentile) believers in Jesus. Whether you’re a Jew or a Gentile, you aren’t saved from sin and death and futility by the good works you do. You’re saved as an act of God’s charity—what the Bible calls God’s grace--toward those who believe in Jesus Christ. On the cross, Jesus did everything necessary for us to be acceptable to God. We simply must believe—or trust—in Him. Thankful that God has loved us in spite of our sin, our mission in life is to do the good works God made for us to do centuries before we were even born. To tell you the truth, whenever I read that last line, telling us to expose darkness, I get uncomfortable. Are we Christians supposed to go around pointing out others’ faults? I hope not because when Christians act this way, we can be awfully ugly! A classic fictional account of the ugliness of Christian moral finger-pointing is The Scarlet Letter, by Nathaniel Hawthorne. It’s the story of Hester Prynne, an unmarried woman in colonial Boston, Massachusetts, who becomes pregnant. The town is scandalized and forces her to wear a scarlet A, standing for adultery, on her clothing. The father of her child, the local pastor, gets off scot free for years. While Hester owned her sin and became a wonderful person and a wonderful mother, the pastor became more and more miserable, something of which the solemn believers in Salem never were aware. There will be times, of course, when Christian love will demand that we point out others’ faults. A few weeks ago, while visiting a hospital, a man, who was visiting his mother, saw that I was wearing a clerical collar and asked if we could speak. He told me that his son was so deeply involved with alcohol that he couldn’t keep a job, couldn’t do anything. What could he do? I suggested that he and the other members of his family get a local counselor to help them put together an encounter group that would confront his son. Though painful for all involved, until the young man was forced to see that the abuse of his body, mind, life, and relationships was a soul-endangering sin, no healing could come. I told this man that I thought he and his family must ask God for the courage to cast a strong light on his son’s sins. When I think of how deeply God has to dive into the slime of my sin and selfishness in order to reach me with the forgiveness and hope He offers through Jesus Christ, I conclude that as Christian, I'm called not to harshly judge others but, like Jesus, try to compassionately meet them where they are. Bill Hybels is the senior pastor of a large congregation near Chicago. He once had a neighbor, a hard-living, cigar-chomping businessperson who had done very well financially, but didn't have God in his life. The guy was gruff and Hybels liked him a lot. After developing a friendship with the guy, Hybels invited him to attend worship at his church some weekend. The guy came to one of the church's services and later, Hybels thanked him and asked him what he'd thought. The neighbor told Hybels he'd enjoyed it a lot. "And," he told Hybels, in language I must clean up for Sunday morning radio, "that was a heckuva sermon." The compliment wasn't couched in dainty church language. Some Christians might have blasted the guy. Or spoken badly of him later. But Hybels recognized that the man was expressing appreciation for what God had said to him through the worship service as well as he could at that point and instead of correcting him, simply thanked his neighbor. He met the guy where he was in order to show him the love and goodness of the God we know in Jesus. You and I need to do the same thing. I think that our lesson from Ephesians isn’t, for the most part, talking about us exposing the sins of others. It’s about something else, I think. Annually, for years now, I’ve gone for a physical exam at my doctor’s office. I do that so that I can learn about any problems that need addressing and to avoid future difficulties. As “children of” God’s “light,” you and I are to volunteer each day to let God give us a thorough spiritual examination. Cast your light on my sins, the psalmist is praying, so that I can see them, turn from them, and walk with You, Lord! When that happens, we can seek God's power to correct those sins that might be blocking God’s power from our lives and so, be prepared for doing the assignments God has in mind for each of us every day we live. When I was a boy, my throat sometimes became sore. I’d try to conceal this from my parents because I knew that they might make me see our doctor. That didn’t appeal to me: I didn’t want the doc shining a flashlight down my throat, poking around, looking for problems. If he did find a problem, I knew, he’d likely prescribe medicine for me. And I hated that, too! It isn’t always pleasant to have our sins exposed, any more than it’s pleasant when, at our physical, the doctor finds some health issue that needs to be addressed. God's prescription for us may be difficult to swallow. God will want us to get rid of our sins. Because we tend to fall in love with our sins, parting with them can be very difficult. The sins we love can be many different things—taking too many deductions off of our income tax, sexual intimacy outside of marriage, acting holier-than-thou with coworkers or family members, giving money first-place in our lives, wanting to keep up with the Joneses, boozing it up, cutting others off in conversations or in traffic, or a thousand other ways that sin can grab hold of our souls. But whatever sin we specialize in, when God points our sins out, we have two choices and two choices only: (1) Keep on sinning and walk away from God; or, (2) Turn from the sin and ask God to help us live life God’s way. As we continue to move through Lent, this time of spiritual renewal, may we all keep asking God to wake us up, to shine His light on those habits of which we may not even be aware that are keeping us from enjoying the close relationship with God He wants all of us to have.